How do you type pinyin tones on Android devices? I’m talking about creating pinyin text (with tone marks), not using pinyin to create Chinese characters. Google has released their updated keyboard app in preparation for Android Lollipop (5.0). 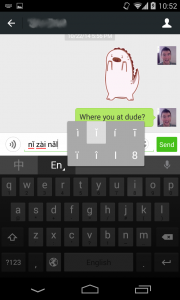 Finally, this keyboard allows us to type pinyin tones! The app is compatible with Android Ice Cream Sandwich (4.0) onwards. You’ll probably want to grab both the updated keyboard app and the updated pinyin input method. Switch to the pinyin input method. Switch to “English mode” (the “En” button next to the “中”). Type letters as usual, but for letters that need tones, long-press the letter and you will be presented with tone options. 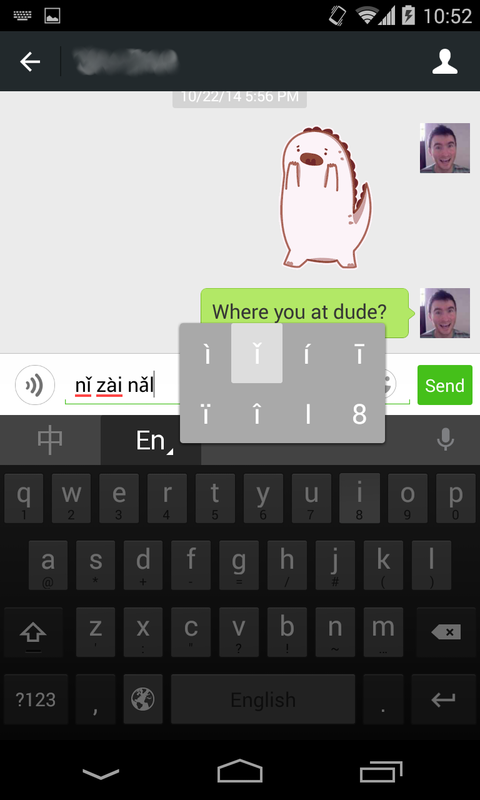 I’ve heard you can also do this with the updated zhuyin input mode, but I haven’t tried it myself. As far as I’ve been able to tell from my own research, there’s no way to type pinyin on an Android device (unlike iOS devices). This includes the default input methods provided by Google, up to and including the latest version of Android (4.4 on my Nexus 4), and any third party keyboards (that I’ve been able to find so far). The only conceivable method I know of is to load up a web site like this Pinyin editor in your Android’s web browser, type the pinyin with numbers (e.g. “ma3” for “mǎ”) and then copy & paste the generated text to where you need it. This is a rather sorry state of affairs. I’ve done a little bit of Android development and have pondered whether I could make something (either an Android keyboard, or an app similar to Pinyin Typist for iOS). However, I’m not sure how much demand there is out there for it. If you’re interested in something like this, please leave a comment! Feel free to include what kind of solution you would most prefer (custom keyboard, standalone app, etc.). It took me a while to figure out how to type pinyin on the iPhone and iPad (iOS). Note that I’m not talking about the pinyin input method used to type actual Chinese characters, but how to type “nǐhǎo”, tone marks and all. The trick is that you can actually type tone marks with iOS’s Simplified Chinese keyboard. Simply hold down the letter that you want to add a tone mark to and it will pop up variations of that letter with the possible tone marks. fēichánghǎo! Of course, this keyboard is normally used to type actual Chinese characters, but once you start adding tone marks, it gets out of the way and doesn’t try to transform your pinyin. choosing “Chinese – Simplified (pinyin)”. I’m sure this would work with the “Chinese Traditional (pinyin)” keyboard too. You should now be able to switch keyboards using the globe icon near to the left of the space bar. For a potentially faster alternative, there is a dedicated app out there that looks like it would be good for typing pinyin quickly, but it’s not free and is a separate app rather than a keyboard mode. This means you’d need to switch apps and copy and paste. Typing pinyin is something I commonly need to do because I like to write up my hand-written notes and printed sheets from my teacher and put them into Evernote. Hopefully this tip will be helpful for other students out there too! Let me know if you have any other tips.